Mark Shenton: What’s the point of theatre programmes in digital world? Never mind that his own bio on the Channel 4 news website is scarcely more illuminating. We find out none of the things he criticises actors for failing to provide. But then there is a sense in which actors become “public property”. By choosing to spend a night in their company watching them do their job – ie. acting – some audience members feel they get a bit more ownership over them. 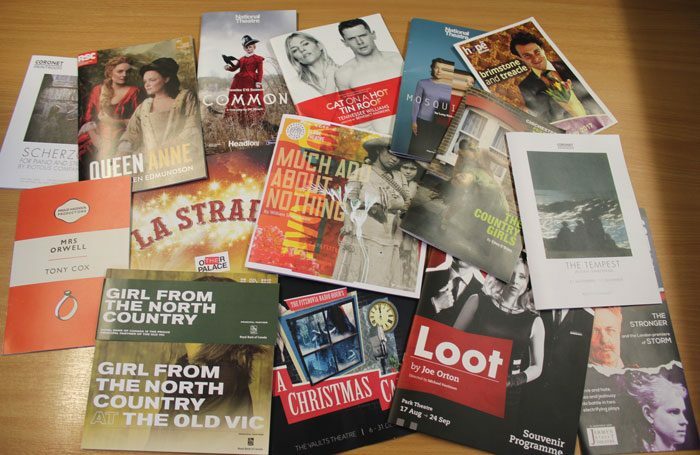 Theatre programmes: do you need them? Critics, of course, routinely get a free programme (except, strangely, at Cirque du Soleil shows), and on Broadway, playbills are free to all. But I always apply the test I also use on theatre tickets to assess how useful they are: would I pay ready money to have one? And the answer is hardly ever. Yet theatre programmes have become a habit for many. They are part of the theatregoing “experience” and a happy aide-memoire of the show. But, I often find the information I need just as easily online. A front of house notice will typically list the cast at a particular performance – especially important with long-running shows where substitutions often appear. So I simply take a photograph of it. As for my stack of programme and playscripts: I used to keep them all, until about 10 years ago when I had four filing cabinets full to the brim. I realised it was no longer practical to keep them all – and especially given that, thanks to Google, I hardly ever referenced them except when I wrote my initial review. So, now I donate them to the library of a drama school.